I'll begin this review by stating that over the past four years I have not been a weekly reader of comic books. A variety of wonderful life-changing moments (i.e. family, teaching, and webcomics work) have kept me pleasantly busy, but I'm back to picking up and reading comics on a weekly basis. Please note that I was not out of the loop completely because I did my best to check out graphic novels and comics from my library, read reviews, and check out the message boards to be up-to-date on my comic book knowledge. Now that I'm back, I've decided to pick up some titles that have caught my attention and one of them is Wolverine and The X-Men #1 by Jason Aaron and Chris Bachalo. When I arrived at my local comic book store, the owner asked if he could help me find a title. I mentioned Wolverine and The X-Men #1 and he informed me it was in stock. He then stated that one of his staff members had read the issue and said it was one of the best comics he had read in a long time. I was a little hesitant to buy the comic at that point because I've been more disappointed than impressed with glowing reviews from comic book store staff. But I decided to give it a shot because I was looking for something good from The X-Men because I had not read Schism. Schism was something I missed, but friends and reviews have provided me with enough information concerning the split between Cyclops and Wolverine. This was nothing shocking because this split seemed inevitable. It was a week or two ago when I saw a 'coming soon' article about Wolverine and The X-Men #1, so I decided to pick up the issue to see how Wolverine would handle the role of being a leader. 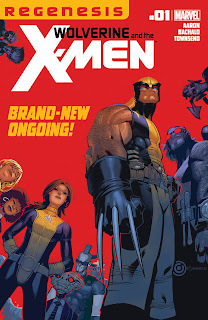 After reading this issue, I was very impressed by Jason Aaron's story where Wolverine and Kitty Pryde do their best to handle a visit from the New York State Department of Education so that they can give Wolverine, the Headmaster, their approval for the Jean Grey School for Higher Learning. This first issue was not a suspense building thriller but a great work of comedy where the representatives from New York State Department of Education try to survive an inspection of the school while Wolverine and Kitty Pryde do their best to keep order among the students and staff. It was fun reading as Wolverine, dressed in a suit, was playing the role of Headmaster. Aaron has developed a cast that will test the patience of Wolverine and it will be interesting to see how this school holds up with him at the helm.I'm sure Wolverine is up to the task, but he has some rowdy kids at his school. The artwork of Chris Bachalo was great. The panels were very nice and his artwork fits the story well. Kudos. I have one observation that could fall into a negative category. As mentioned earlier, I did not read Schism but I know a little bit about the character, Kade Kilgore. He's involved in this issue and it would be hard for someone to convince me that this L'enfant terrible is not Marvel's version of Damian Wayne. The annoying evil child super genius is not an effective villain in my opinion because he or she is still a child with a developing brain, plus writers put words into their mouths at times that do not fit the age. This is dangerous territory and a skilled writer can handle this type of character effectively. If Aaron is up to the task then I wish him the best of luck. As a reader that has returned to the X-Men universe following a lengthy absence, I feel that this is a very good story. We have great writing and excellent artwork. Aaron is developing his characters and has created a situation where Wolverine and Kitty Pryde will have their proverbial hands full of problems caused by teen angst. TonyDoug Wright is the owner and editor of Champion City Comics. He is the writer for RED DEVIL.